Yokogawa Electric Corporation (TOKYO: 6841) announces that it will release an enhanced version of the STARDOM™ network-based control system in the first quarter of fiscal year 2018. This new version of the STARDOM system will include a new E2 bus interface module that has been developed for use in FCN-500 autonomous controller extension units. This enables the construction of systems that have more I/O points and cover a wider area. This new STARDOM version will be exhibited at the System Control Fair 2017/Measurement and Control Show 2017 TOKYO, which will be held from November 29 to December 1 at the Tokyo Big Sight exhibition center. 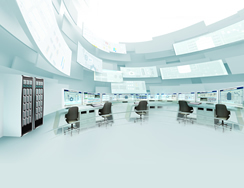 STARDOM is a network-based control system that consists of the FCN autonomous controller, the VDS web-based HMI, and the FAST/TOOLS™ SCADA package. Since first releasing STARDOM in 2001, Yokogawa has continued to improve the functions of this system to satisfy its customers' evolving needs. One such recent need is for the collective monitoring and control of applications where many different input and output devices are distributed over a wide area, in locations where conditions are often harsh. Other needs have included the reduction of wiring and maintenance costs while ensuring high reliability. Based on its twin goals of achieving excellent scalability and excellent reliability, Yokogawa has sought to satisfy these needs by strengthening the functions of its STARDOM system. The FCN-500 is a modular type controller. It consists of a control unit with a CPU module mounted on the unit's base module. (An additional CPU module may be installed for dual redundancy.) Extension units that accommodate I/O modules can also be utilized. 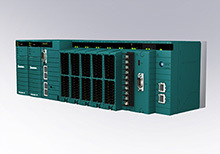 To connect a control unit with an extension unit, Yokogawa has developed the E2 expansion bus. The E2 bus consists of an E2 bus interface module that is installed on each unit and a general-purpose Ethernet cable. With this E2 bus, up to nine units can be connected (including the FCN-500 control unit), a threefold increase. As a result, the maximum number of allowable I/O points has been tripled. Using the high-speed CPU module that was released in March 2016, a much larger system can be constructed based on the FCN-500. In addition, the maximum possible transmission distance between individual units has been increased to 100 meters. Therefore, with a 9-unit configuration, the maximum transmission distance is 800 m, which is 100 times longer than what was previously possible. Using commercial fiber optic cables and media converters, a STARDOM system spanning distances of several kilometers can be constructed. The installation of extension units near sensors reduces wiring costs and maintenance workload. Three different types of base modules are available: a long base module with slots for 10 modules, a short base module with slots for five modules, and a new compact base module with slots for three modules. Customers can combine these three different base module types depending on the required number of I/O points and the amount of space available for installation. The new E2 bus as well as the CPU, power supply, control network, and internal bus of the FCN-500 can all be duplexed. Thus, even when a large system is configured using the E2 bus, high reliability is assured. Maintenance is also a key factor in ensuring high system reliability. As with previous STARDOM versions, it is possible to check the operating status of the modules in the extension units and quickly detect any malfunctions using the VDS HMI, FAST/TOOLS SCADA, and other means, and any damaged modules can be replaced without having to shut down the FCN-500 controller. In addition, the new extension bus interface module has been built to withstand ambient temperatures as extreme as -20℃ and 70℃. (Our existing interface module supports a range of 0-55℃.) This enhancement will make it possible to install extension units in locations where environmental conditions are extremely harsh. STARDOM is an open network control system consisting of components for control, operation, and monitoring functionality, and its ideal combination of the reliability of a DCS and the versatility and economy of a PLC is highly acclaimed. The FCN autonomous controller, the core of STARDOM, is robust and can be easily implemented in a dual redundant configuration. The controller is widely used as an intelligent remote terminal unit (RTU) not only in applications that require high reliability and versatility/economy, such as small- to medium-size plants, but also in oil and gas well (upstream) and pipeline applications. Since first releasing STARDOM to the market in 2001, Yokogawa has continued to improve the functions of this system to satisfy its customers' changing needs. Based on our concept of "Faster, Stronger, Smarter," we released a new CPU module in March 2016.